Despite significant improvements in automobile safety and in the design of roads, car accidents remain quite common. It is likely that any given person will be involved in at least one serious automobile accident during his or her lifetime. This article explores when a car accident may result in litigation. If you are involved in a car accident, you may benefit from reviewing our suggestions about what to do after a car accident. Even if injuries result from a car accident, not all accidents result in litigation. If the injuries that result from the accident are minor, it may be possible to settle a claim directly with the at-fault driver's insurance company, with a settlement that includes payment of medical bills, for property damage, and possibly also for pain and suffering resulting from the injuries. Even were damages are significant, in some cases it is possible to settle a claim without the need for litigation. However, the greater the amount of damage that results from a motor vehicle accident, the more likely it becomes that a party seeking compensation for injuries will file a lawsuit. Most automobile accident litigation involves accidents between two vehicles. The driver or passenger from the first vehicle claims an injury as a result of the accident, and that the driver of the second vehicle caused the accident through negligent driving. Some car accident claims are brought by vehicle passengers against the driver of the vehicle in which they were riding, alleging that the driver caused the accident that resulted in their injury. Passenger claims against the driver may be made in the context of single vehicle accidents, as well as accidents involving other vehicles. After a car accident, sometimes a driver will bring a claim against a government agency that was responsible for creating and maintaining the roadway where the accident occcurred. A claim against the agency may allege negligence in the design or maintenance of a roadway or intersection. Disregard of traffic control devices including traffic lights and road signs. A person or object at the side of the road may draw a driver's attention away from the road. The driver is eating in the car, and spills or drops food. The driver is dialing a cellular phone, texting or using the Internet while driving. A driver attempts to read a book or article while driving. A driver puts on makeup while operating a vehicle. An insect gets into the car and distracts the driver by crawling or flying inside the vehicle. For most accidents that result from distracted driving, the cause of the accident is the driver's becoming lost in thought with that inattention resulting in an error that results in an accident. Intoxicated drivers are at significantly increased risk of involvement in an accident. An intoxicated driver is less able to perceive and respond to events outside of the vehicle, such as mistakes by other drivers, and thus is less likely to avoid an accident than is a sober driver. Accidents involving intoxicated drivers are more likely to involve physical injuries. Bad weather conditions may contribute to a motor vehicle accident, especially when drivers do not respond appropriately to the effect of the weather on their ability to safely operate their vehicles. Drivers may be affected by strong cross-winds, and rain, sleet, snow and ice may cause a road to become dangerously slippery. A road surface be dangerous from black ice. Unusual rainfall may cause roads to become flooded. At times a driver will not be able to detect a hazardous condition until it is too late to avoid that hazard. Make it more difficult to maintain proper lane placement. Drivers should consider the weather conditions when driving, and should reduce their speed to a safe level even if that speed is below the posted speed limit. When weather conditions are particularly bad, sometimes the only safe thing to do is to get off the road, park, and wait for conditions to improve. When a road or intersection is poorly designed, drivers may be at a significantly increased chance of getting into an accident or of having an accident that results in bodily injury. Highway entry and exit ramps that are poorly designed, such as being too short to allow for safe acceleration, deceleration and merging of traffic. In some motor vehicle accident cases, the government agency that is responsible for the design of a road or highway may be liable for creating and not correcting its unsafe condition. Beyond design, the condition of a roadway may cause it to be unduly hazardous, increasing the risk of accidents and injuries. For example, a road surface may be poorly maintained with gaps and potholes that, if hit, could cause a tire blowout or potentially cause drivers to lose control of their vehicles. Road conditions may also be affected by weather, or by debris on the roadway. When on notice of the problem, sometimes the government agency responsible for accidents that result from a road condition that is not addressed or corrected within a reasonable amount of time. When a vehicle is defective, the defect may contribute to the cause of an accident, may cause injuries that are suffered in an accident to be worsened, or both. Vehicle defects can arise suddenly, or may result from poor maintenance. Common defects that contribute to accidents include tire blowouts, brake failure, or other mechanical failure that occurs while the car is in motion. Some SUVs and large vans are particularly suscpetible to rolling over when they go off balance or are involved in an accident. A car with a defective fuel tank may be more likely to burn or explode as the result of an accident. A defective airbag or seat belt may fail during an accident, causing an occupant to be more severely injured or potentially ejected from the vehicle. A claim against a mechanic or service center whose improper or inadequate work left a vehicle in a hazardous condition. A hit-and-run accident occurs when the driver who causes an accident fails to stop at the scene of the accident, and instead attempts to drive (or run) away and avoid being held responsible for the accident. If a hit-and-run driver flees the scene of the accident, it may be difficult to later identify the hit-and-run driver. If the driver cannot be identified, the victim of the accident will not be able to proceed with an insurance claim or injury lawsuit against that unidentified driver. Accidents between cars and pedestrians can be very serious. As a pedestrian is not protected, as a result of being hit by a car the pedestrian may suffer catastrophic injury, potentially life-changing injuries that may require significant medical treatment, and may result in disability or death. Pedestrians may have difficulty proving an injury claim against a driver. 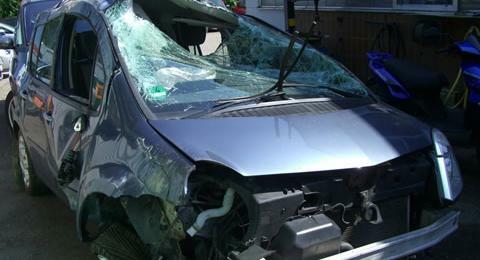 The driver is likely to claim that the pedestrian was partially or entirely at fault for the accident. If no independent witnesses saw the accident occurred it may be difficult to determine what happened and whether the driver of the car should be held liable. As motorcycle riders have little protection from other vehicles and the roadway, accidents between motorcycles and other vehicles place riders at risk of serious injury. Motorcyclists may be seriously injured in accidents what would be relatively minor if they occurred between two cars. Studies of accidents between motorcyclists and other vehicles indicate that in most cases the accident is the fault of the driver of the other vehicle. However, eve where the other motorist was clearly negligent. Studies also suggest that many jurors are predisposed to find motorcyclists responsible for accidents. As with pedestrians and motorcycle riders, accidents between bicycles and cars put cyclists at risk of serious injury. Bicyclists are also at particular risk from having vehicle drivers or passengers open car doors in front of their oncoming bicycles - a hazard that can cause the bicyclist to be catapulted over the car door in a collision. Drivers who are involved in accidents with bicycles often report that they did not see the bicyclist until after the collision occurred, or that they misjudged the bicyclist's speed. Some bicyclists do not regularly follow the rules of the road, and disregard traffic signals or ride on the wrong side of the road. Riding in that manner increases the risk of an accident, and also contributes to the perception among some jurors that most bicycle accidents result from the action of the cyclist and not the driver. Given the relative size and mass of a typical bus, bus accidents may involve significant risk to drivers and passengers in other vehicles. The size of a bus offers some protection to its passengers, and many buses incorporate passive restraints that are meant to reduce risk to passengers if the bus is involved in a collision. However, as bus passengers are usually not restrained they may be at increased risk of injury as the result of an accident. When school buses are transporting children, another point of risk arises when children board the bus and get off of the bus. Despite the warning signs and lights placed on school buses, whether due to an error by the school bus driver or a disregard of the warnings by another driver, sometimes students are injured when crossing the street to board a school bus, or are struck by a vehicle after getting off of the bus. The consequences of an accident between a semi or tractor-trailer and a smaller vehicle may result in devastating injuries to the driver and passengers of the smaller vehicle. The operators of big rigs may be liable for accidents with other vehicles based upon negligent driving. The driver may operating in violation of federal regulations that restrict how many hours per day an operator may drive the vehicle, and how many hours of sleep the operator must get each night. The driver's employer may be requiring drivers to violate the rules or turning a blind eye to violations. The driver or owner of the truck may have neglected to perform proper maintenance on the vehicle, increasing the risk of accident. Many drivers are paid by the mile, and thus may be inclined to bend or break rules that limit their time on the road in order to earn more money. However, those rules help ensure that drivers are alert and properly rested, with driver fatigue creating serious risk for other motorists. Some car owners modify their vehicles to improve their appearance or performance. While many after-market modifications are safe, some modifications may pose dangers to drivers and passengers and increase the chance of an accident. For example, after-market headlights or fog lights may be excessively bright or positioned in a manner that can potentially blind other drivers. Dark window tinting on a windshield may make it difficult for the operator to properly observe the road. When an unlawful or dangerous vehicle modification causes or contributes to an accident, the owner of the vehicle may be held liable for injuries that result from the modification. A body shop or other facility that makes or installs modifications that are not street legal, knowing that the vehicles they modify will be operated on public roadways, may also be liable for accidents resulting from the modification. Sometimes an accident results from objects, debris or other substances on the surface of the roadway. Some objects or items that are on the road may cause other vehicles to lose traction, to swerve in order to avoid striking them, or be thrown up by the tires of one vehicle into the windshield of another. When an accident results from debris on the roadway, it may be difficult to determine how the object or substance got onto the roadway, and who is responsible and potentially liable for its presence. For example, even a few minutes after a part or object falls off of a vehicle, that vehicle and any witnesses to the incident may be miles away from the location of the debris. If the presence of the debris causes an accident, it may difficult and even impossible to identify the vehicle or driver that is responsible for its presence. Some states also limit liability claims against a driver or other person who is responsible for the presence of the object or debris, based upon the amount of time that passes between the time the debris falls onto the roadway and the time the accident occurs. In a car accident lawsuit, the claim is normally brought against a driver who is alleged to have caused the accident. In cases involving more than two vehicles, sometimes the claim will be made against more than one driver. Sometimes a passenger will be a defendant, based upon a claim that the passenger caused or contributed to an accident. For example, the passenger may have grabbed the driving wheel as a joke, causing the driver to lose control. Sometimes a car accident claim will be based on factors outside of the vehicle, such as the design or condition of the road or intersection where the accident occurred. Most claims are based on negligence. Driver's have a general duty to operate their vehicles with an appropriate level of care for the safety and property of others. A negligence claim alleges that the person who caused an accident violated that standard of care and, as a foreseeable consequence, caused the plaintiff's injuries. Governmental Immunity: If the driver who causes an accident is a governmental employee who is working at the time of the accident, or where the accident involves a government-owned vehicle, the law may limit an injury victim's ability to sue the driver or government agency. Owner Liability: If the driver of a vehicle is not the owner, but has the owner's permission to operate the vehicle, the owner may potentially be liable for injuries that result from an accident under theories such as owner liability, vicarious liability, or negligent entrustment. Employer Liability: If an accident is caused by an employee who is driving a vehicle while on the job or, as the lawyers might say, within the course and scope of employment, the employer may share liability for injuries caused by the employee's negligent driving conduct. Work-Related Phone Usage: If a driver who causes an accident is talking or texting on a cellular phone at the time of the accident, the phone usage was work-related, and the driver's employer expects employees to handle work-related phone calls or messages while driving, the employer may share liability for an accident caused by the employee. Most drivers who are involved in an accident are covered by car insurance. Problems may arise when a driver is uninsured, where a driver carries an inadequate amount of insurance, or where an insurance company does not fulfill its duties to an insured party. When the driver who causes an accident is not insured, it is usually difficult for persons who are injured in a motor vehicle accident to recover compensation for their injuries. In some cases it may be possible to find a third party who is also liable for the injury, but in many cases the only liable party will be the uninsured driver. Unfortunately, many uninsured drivers have few if any assets that can be reached to contribute to an award of damages, and are effectively judgment-proof. Many drivers carry uninsured motorist coverage on their own auto insurance policy. That coverage may provide compensation for injuries suffered in motor vehicle accidents when the driver who caused the accident cannot be located or does not carry liability coverage. Sometimes the uninsured driver does not cause an accident, but instead wants to pursue an injury claim arising from an accident. Many states restrict the ability of an uninsured driver to recover pain and suffering damages from an accident, and the uninsured driver may be limited to collecting only economic damages - out-of-pocket costs such as the cost of repairing their vehicle and their medical bills. An underinsured driver carries liability insurance, but at a level that is insufficient to cover the damages that are caused by an accident. While drivers are normally required to carry insurance on their vehicles, in most states the minimum amount of insurance that is required is very low. In order to save money, drivers who have poor driving records or prior convictions for impaired driving will often carry the least amount of insurance required by state law. Unfortunately, that puts other drivers at risk of not receiving adequate compensation if injured in an accident caused by somebody who is already established as one of the worst or most dangerous drivers on the road. Some insurance companies offer underinsured motorist coverage, insurance that drivers can obtain on their own policies that will provide compensation if they are insured by a driver whose liability insurance coverage is not adequate to pay adequate compensation for injuries that result from a motor vehicle accident. Your insurance agent can advise you as to whether underinsured motorist coverage is available from your auto insurance company. An insurance company has a duty to deal with its clients in a fair and honest manner. Even so, when people make insurance claims they sometimes encounter bad faith conduct by their insurance company. An insurance company may offer inadequate compensation for a totaled car, and refuse to offer fair market value. In a no-fault states, in which drivers carry insurance for their own accident-related medical care, an insurance company may improperly refuse to provide benefits owed under the policy, inappropriately deny a claim, or refuse to pay for or reimburse the cost of necessary medical care. A statute of limitations is a law that imposes a time limit on the filing of a lawsuit to recover damages from another person, including claims for damages to persons or property resulting from a motor vehicle accident. Any person who is considering bringing a claim for injuries as a result of a car accident should be aware that their ability to pursue their claim will be limited by the statute of limitations for the jurisdiction where the accident occurred. Once the statute of limitations expires, a lawsuit cannot be sustained against a defendant who properly raises a statute of limitations defense. It is best to pursue any legal claim arising from a motor vehicle accident well before the statute of limitations runs. If an injured person is concerned that the statute of limitations has run or is about to run, that person should consult a personal injury lawyer for a review of statute of limitations issues and, if possible, to get a lawsuit filed before it becomes time-barred.